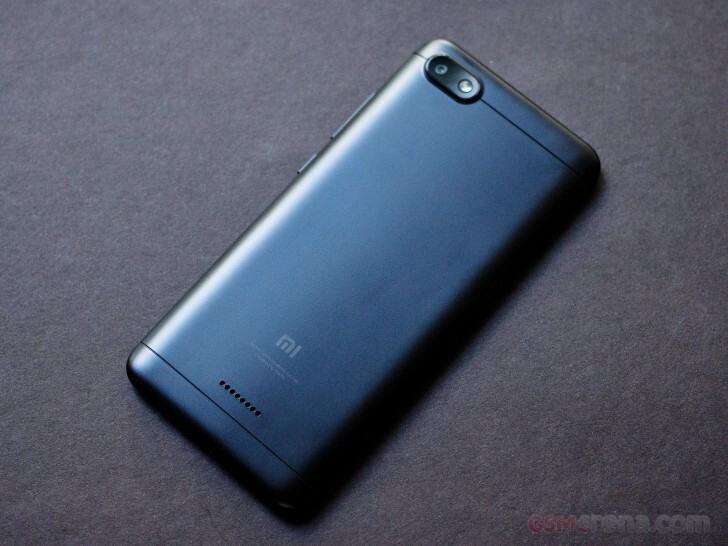 The basic body of the Redmi 6 and the Redmi 6A is actually the same. The two phones look nearly identical and have nearly identical dimensions. 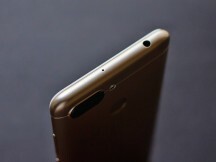 The difference comes from the presence of a second camera and the fingerprint sensor on the back of the more expensive Redmi 6, which is also 1g heavier. 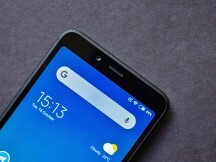 Compared to last year's models, both phones feature a more modern design with an 18:9 aspect ratio but thankfully no notch (not yet, anyway). Our review units were in Gold for the Redmi 6 and Black for the Redmi 6A, which allowed us to see the bezel differences on the front. The bezels are, of course, identical in size but because the Gold model, along with the Rose Gold and Blue, have white bezels, they tend to look far bigger in practice and are significantly more distracting. Not only are they noticeable when the screen is off, it looks like your content has a frame when the display is on. In comparison, the black bezels blend perfectly with the display when it's off and even when it's on they don't attract much attention to themselves. 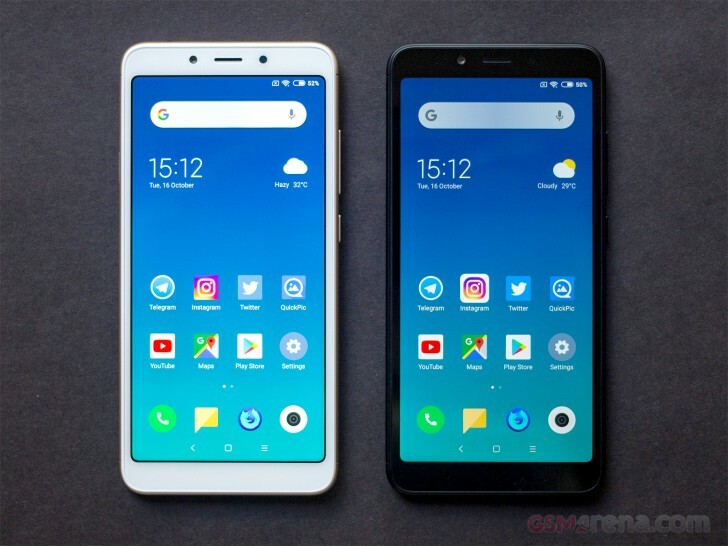 You can see in the pictures how the Redmi 6A actually looks smaller than the Redmi 6 despite the two being the same size. The glass on the front is a standard affair with no curve edges. It is scratch-resistant although we don't know the brand name. 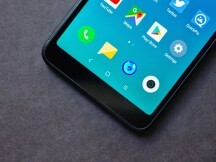 The glass also has adequate oleophobic coating. 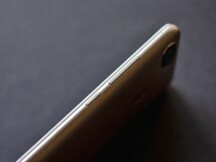 Along the side are the power and volume control buttons on the right, headphone jack on the top, a SIM and microSD card slot along with a separate slot for the second SIM on the left and the microUSB connector on the bottom. 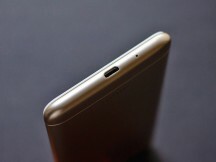 The back of both phones seems to be made out of one piece of plastic with lines running along the top and bottom. Near the top is the camera bump, which extrudes a fair bit from the back. 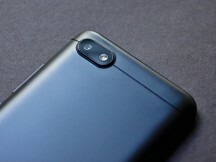 The Redmi 6 has dual camera system with a flash on the side and the Redmi 6A has a single camera with the flash replacing the second camera lens. The glass doesn't cover the LED to avoid refractions while firing the flash. The back of both phones is painted plastic that seem to mimic the look of metal but not convincingly enough on the light-colored models. The black does look quite good, though, and is visually indistinguishable from metal until you actually feel it. Both phones have their single loudspeaker placed on the back, which is a rather unfortunate position all things considered. 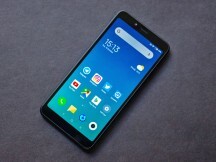 The fingerprint sensor on the back of the Redmi 6 falls perfectly under the index finger if you rest the phone in your palm but a bit of a stretch if you rest the phone on your pinky finger. A slightly lower position could have worked out for both. Both phones are pretty compact and lightweight. They are plasticky and don't feel especially premium in hand but they are still well put together and nothing creaks or rattles. We wouldn't even bother putting these in a case and there isn't one provided in the box, either. 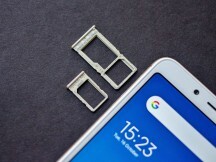 Both the Redmi 6 and the Redmi 6A have identical displays. It's a 5.45-inch IPS LCD panel with a resolution of 1440x720 in 18:9 aspect ratio. At 295 PPI, the pixel density is just shy of the 300 PPI mark we generally look for in smartphones these days for an adequate viewing experience. And adequate, it is. The overall display quality is perfectly acceptable for phones in this price range. The resolution is mostly fine, provided you don't stare at the screen too closely. The color accuracy at the Standard picture setting seemed really good to the eye. The displays also get reasonably bright outdoors and also have good viewing angles. Overall, not much to complain about. For the price, most users will be happy with the display on offer here. Again, both phones here have the same 3000mAh battery. 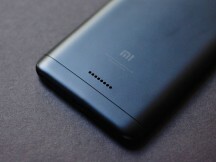 The battery life is also similar between the two, with about 4-5 hours of display time and over 20 hours of overall battery life, which should last about a day for most users. It's not the best battery life in the segment - for that you'll have to consider a Redmi Note - but it's not unreasonable, either.